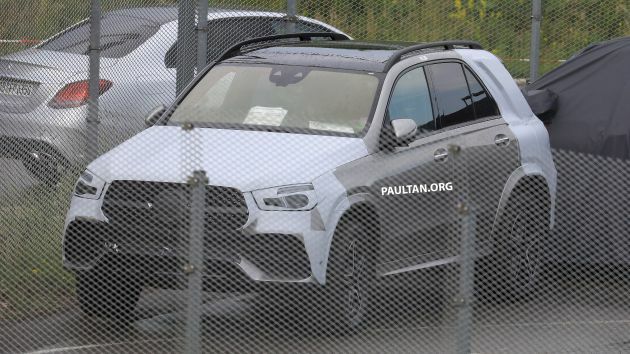 SPIED: 2019 V167 Mercedes-Benz GLE drops camo! 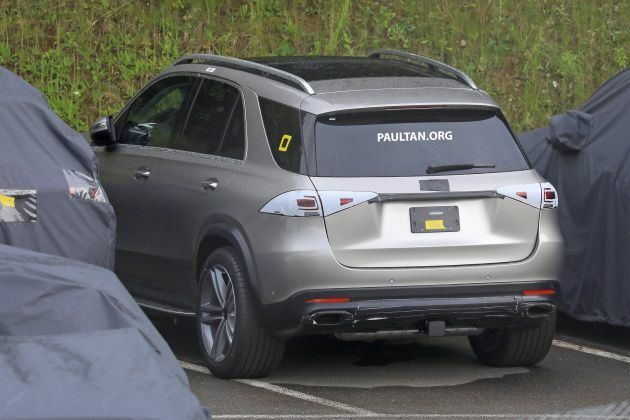 Home » Cars » SPIED: 2019 V167 Mercedes-Benz GLE drops camo! It’s June now, which means we’re getting closer to the world premiere of the all-new V167 Mercedes-Benz GLE. A prototype mule has been spotted once more, this time seen wearing a lot less camouflage vinyl to reveal the actual metal underneath. As seen in the picture above, the next-generation GLE is set to get a much sleeker overall design, and the rump now features a new sculpted tailgate design, complete with slim LED tail lights and an adjoining element. Two large exhaust exits can be seen in the lower bumper as well. Round the side, the new GLE’s shoulder line sits closer to the window line and appears to look more visually subdued compared to that on the outgoing model. In fact, the rear doors appear to have been elongated, presumably to improve ingress and egress. The glass panels from the C-pillar onwards have been carried over, but the rear windscreen is more steeply raked and is shorter, giving the SUV a sleeker appeal. Up front, it could possibly get the similar dual LED DRL headlights seen on the W213 E-Class, albeit redesigned to suit the SUV’s look. From what we can tell, the GLE will get the company’s popular diamond grille with a sole louvre to go with tristar badge, although the most polarising approach, design-wise, goes to the lower front bumper. This is likely to be an AMG Line variant, and it’s unclear at this point if there’s functional air ducts within. From this set of pictures however, it sure doesn’t look like it. How do you like the looks so far? Inside, expect the new GLE to be completely redesigned. Early spy photos show that it could look a lot like W213 E-Class, but with its own unique quirks. Also fitted to the test mule was a smaller-diameter steering wheel, one that may or may not find its way to production. What else can we expect? Well, the new SUV will be built on the same Modular High Architecture (MHA; basically a modified MRA underpinning the C-, E- and S-Class) that will be shared with the next GLS. It will apparently be significantly lighter than the current model, with entry level models expected to ditch all-wheel drive to sit under the two-tonne mark. It’ll be more aerodynamic as well, with drag coefficient dropping from 0.32 to 0.30 Cd. Again, the V167 Mercedes-Benz GLE is slated to debut in the second half of the year, and it will take on the G05 BMW X5 head on. In terms of looks, which do you prefer, the Merc or the Bimmer? Let us know in the comments section below. No complain for the front design, that C-pillar look awful. The back light look to small for a big suv even the glc have a bigger rear light. Interior design 10/10. Front looks like ASX, rear CX5, interior is so plasticky. Duh. Sack the designer! Are they going to call that colour Urine Metallic? At first i thought it was a mitsubishi outlander from behind! Next Post: OPINION: Does Malaysia really need a new carmaker?